If your garage door is not closing properly or if your springs, cables or rollers need to be replaced, our team can help you. Find out what we can do for you by taking a look at the projects our team completed recently. Customer Issue: Abrupt opener failure left the customer in need of something inexpensive, powerful, and readily available for a quick replacement. Our Solution: The Genie 1035-V chain drive opener fit Ms. Gunner’s needs with only a minor increase in noise due to the switch from belt to chain drive, and her trolley was versatile enough to handle either. The new opener worked beautifully once our team programmed and synced it with the remote. 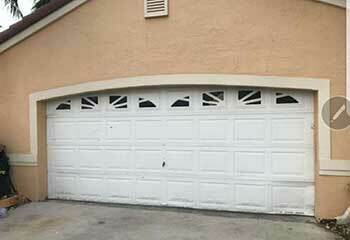 Our Solution: Because the door was relatively new and only one panel was dented, we were able to find the exact match for the same size and color from the original manufacturer. 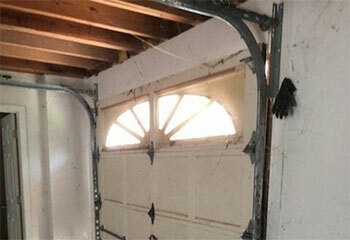 We removed the damaged section and replaced it without spoiling the door's aesthetic look and curb appeal. Customer Issue: Door was forced off its track. Our Solution: The malfunction occurred because of a sharp dent in one of the horizontal tracks, which was also covered with large stains of rust. We therefore replaced the entire set with a new one, and the realigned the door and made sure its rollers were able to move smoothly again. 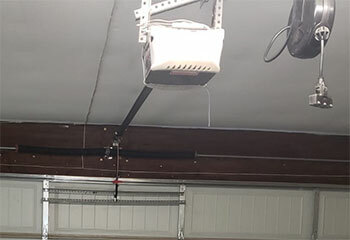 Our Solution: We took careful measurements of the interior and exterior parts of the customer's garage, and then presented her with several different options of varying designs. 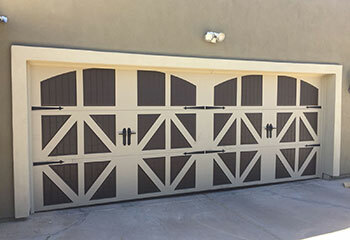 She choose a carriage house garage door from the Amarr® Oak Summit® collection, which we proceeded to install for her a couple of days later.